These California restaurants aren't just near the ocean, most of them have great ocean views along with great food and service, too. We're not sure exactly what it is about this place. It sits on a little jutting bit of land that gives it fine Big Sur coast views, the building designed by a student of Frank Lloyd Wright sits so well on the site that you might think it grew there and the laid-back ambiance can't be topped. Mission Ranch is an unassuming-looking place, sitting on the edge of Carmel with a view of the bay and Point Lobos in the distance. In between, a herd of sheep grazes in the meadow, seeming as relaxed and contented as the diners on the patio. No matter what the weather, Mission Ranch never disappoints with a reliable menu of well-prepared classics. On a sunny day, it's so beautiful that you may not even notice what's on your plate. And speaking of those sheep, we've seen them get a round of applause for the cute way they all hurry into their shed at dusk. This place retains its charm thanks in part to owner Clint Eastwood, who saved the former dairy farm from being covered in condominiums. It's hard to beat the ocean views from pretty La Jolla, just north of San Diego. 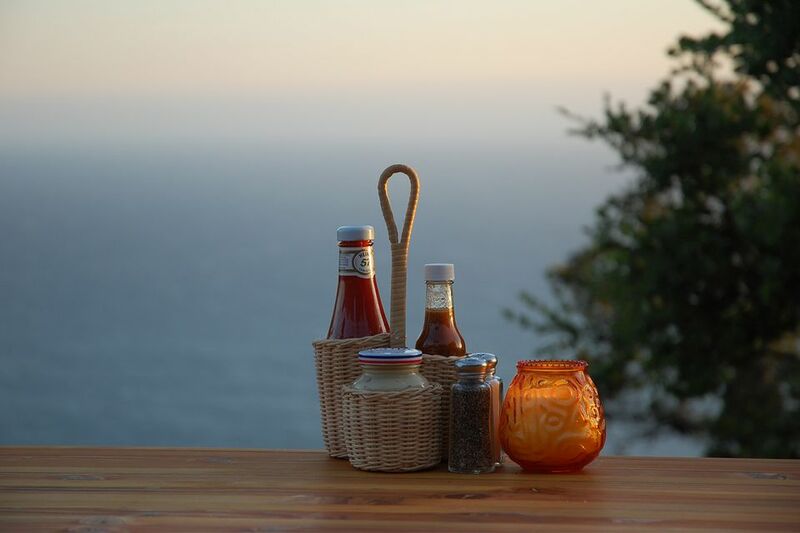 George's at the Cove is a long-time favorite here, with food to match the view. On a sunny day, head for the rooftop dining spot, where you can take in sun and scene all at the same time. Everyone calls their ocean views "spectacular." And their French cuisine rates well, too. Some folks say if you can't make it for dinner, try happy hour - for the quality, it's one of the best deals in town - and it shares the same view as the dining room. You can't beat the views from Geoffrey's, but there's also its rich history and the pure cachet of saying casually: "when we were dining in Malibu..." Their outdoor tables are little bit of heaven on a pretty day and everyone raves about their Sunday brunch, too. This place is what you might call hidden in plain sight, sitting on the back of the Monterey Plaza Hotel. Both of the dining areas overlook the Monterey Bay, but the casual Schooners Bar is our favorite, with an outdoor terrace that hangs right over the water. While dining at Schooners, we've seen sea otters playing in the kelp, sea lions bobbing next to brightly-colored kayaks - and even a celebrity or two. A fresh take on a Marin County landmark, Nick's Cove sits on a pier that juts into the water with views of Tomales Bay. Seafood is fresh and locally-farmed oysters are always a great choice, but they also do a great job with everything on the menu. Try for a seat near the windows, or out on the patio on a nice day for the best views of the bay. The Redondo Beach Pier is one of Southern California's busiest, built in a horseshoe shape, with views out toward the ocean and Catalina Island. Kincaid's sits at a particularly pretty spot, with windows across one entire wall, looking out to sea. Food is nice and the lunch is quite affordable. Located in a converted warehouse at historic Fort Mason, Greens offers views of the Golden Gate Bridge out their floor-to-ceiling windows and you can see out from every seat in the house. The menu is all vegetarian menu, but chef Annie Somerville's cooking is so good that even our most carnivorous of friends don't seem to miss the meat. The view is especially nice in ​the late afternoon and early evening. The Lobster sits right above the Santa Monica Pier and they've been serving happy customers since 1923. Their longevity is the first clue that they've got it right, but so are their Yelp! reviews, some of the best we've seen. Get there around sunset and you can enjoy watching the pier's amusement park rides light up. Try for a window-side seat in the nautical blue-and-white dining room and you'll get a sweeping view of the Santa Monica Bay. One Pico is located in Shutters on the Beach hotel, and while it might be hard for the food to outdo the view, Travel & Leisure magazine says it's the "best hotel dining room in Santa Monica."